Based on social media posts from my virtual colleagues, it seems that many of us are ending the year with a unit on Paris for our French 1 students. In my case, I found that this unit was a great way to bring in some vocabulary for places in a city and transportation. In addition, the students are gaining important knowledge about a city that many of them will have an opportunity to visit at one time in their lives. Because I think it’s very important for the students to become familiar with various attractions in Paris, I began this unit with a series of learning stations designed to introduce the students to the tourist attractions they might visit on a trip to Paris. Although these stations are based on authentic resources that I have accumulated over the years (and can’t realistically share here), I’ve included a quick explanation of each station. Paris Children’s Books: I have two children’s books that students could read at this station. They worked with a partner on the comprehension activity, so that four students in the group were able to read a book in its original form, without relying on photocopies. Paris ID Station: At this station students completed a series of teacher-created activities designed to help them learn to identify each monument visually. I included a Go Fish game that I made with photographs of the monuments, a matching activity in which they had to identify unlabeled photographs by comparing them to Paris monument postcards, a lotto game in which they had to fill a board by drawing pictures of monuments from a pile , an activity in which they had to identify monuments based on photographs I had taken at unusual angles, etc. Paris Brochures: Here, the students read brochures that I have brought back from various monuments and answered comprehension questions. These brochures were a great way to reinforce vocabulary for days of the week, months of the year, and telling time! After the students had completed all 5 stations, we spent a few days reviewing the monuments using a Google Presentation ( https://docs.google.com/a/hilliardschools.org/presentation/d/1_3jd7FibPFNenBeXS8ujpSEERbnQ4cLU0c9ax_S3PFY/edit?usp=sharing) which I would project and ask questions about. To further reinforce this information, I had the students create Bingo boards on a sheet of paper. For this very low-tech activity, they made a grid of 5 x 5 squares and wrote the name of an attraction on each one. I would then give a clue (either a picture or a fact about the monument) and they placed a chip on the square with the appropriate monument. Note: There are more than 25 attractions, so some students won’t have some of the monuments I describe, just as with regular Bingo. Due to the simple nature of the language used, the students were able to understand my questions and clues for these activities with very little difficulty. As an additional resource, I created this Google Presentation with photographs only. (https://docs.google.com/presentation/d/1THhX7NIaLmQoImP3RgGxYQUJm1apE9J5Lg3QxnchJ5g/edit?usp=sharing) . Because I will eventually hold the students responsible for identifying the monuments visually, I wanted to provide an easy way to practice identification. (Note: There are currently a few extra attractions on this presentation. When time permits, I’ll update them so that they have the exact same attractions.) The students have access to both presentations, so that they can further review the facts and images from home. After the students are able to identify the monuments and know some factual information about each one, they will begin preparing for their IPA. This document contains a few structures and vocabulary items they’ll need to know and a couple of quick activities to practice the skills they will use on the IPA (Paris IPA Practice ) Namely, they will list activities they would like to do in Paris, practice discussing these activities with a partner, and then will create an itinerary for a trip. After these practice activities, they should be ready for their IPA (French 1 Paris IPA ) which contains the following tasks. 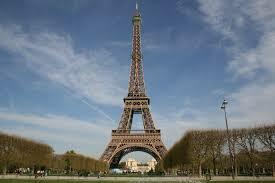 Interpretive Listening: The students will watch a video about 10 Paris attractions and complete an interpretive task. Interpretive Reading: The students will read several pages paris 1, paris 2, paris 3, paris 4, paris 5, paris 6, paris 7, paris )from a children’s book about Paris and complete comprehension activites. Interpersonal Communication: The students will discuss possible activities to do in Paris and co-create a simple itinerary. Presentational Writing: The students will write a letter to a family member in which they describe their itinerary and ask for a financial contribution for the trip. This IPA, along with a simple assessment on Paris monuments, will be the final exam for these students. I’m so proud of what these students have accomplished this year and looking forward to following their progress in the years to come! This entry was posted in French 1 Units, Integrated Performance Assessments (IPA's) on May 13, 2015 by madameshepard. Would you mind sharing which children’s book that is. It looks wonderful,even for my own children. Sure, it’s called Mes annees pourquoi, Paris and is published by Milan. I loved the visuals. It looks like there are some other great titles in the series that I might have to check out! How long did it take your students to get through 5 stations? The students do one station per day. The listening didn’t take the whole time, so I had them go back to a station they hadn’t finished with the remaining time. We have 48 minute periods. I am so grateful you are willing to share your ideas! They have been so helpful as I have been working on my own units this year! Something fun I am doing with my Paris unit this year is running the Seine through my classroom and the students are doing a gallery walk to hear about the monuments they have researched. They have to stand in the area of “Paris” where the monument would be located. They are loving it! What a great idea, thank you so much for sharing it! I have the fan resource. I would be very grateful if you would share your questions. Merci! Hi, Julie. I added a document with the “fan” questions to the original post. I didn’t write questions for every single monument, but I did include several of them–more than my groups could finish in one class period. Is there any way you could upload the descriptions that go with the monument cards? I tried to find them online to buy but I’m having no luck. Thank you so much! I used the ISBN number to find it here in the US. What a great resource! What a great idea to use stations! It’s not often done at HS. Thank you for reminding me of this effective way to vary delivery. How can the Power Point be accessed, please? Merci mille fois! Would you mind sharing some/all of your activities from the Paris ID station? I used this unit to finish my French 1 last year and am going deeper into parts of it as a review for the start of French 2 this year. Also (and most importantly) — many, many thanks for this blog and for sharing so freely. I am more grateful for this than you can imagine. Is anyone else having trouble with the first video on the listening station activity? I wonder if anyone knows the name of the video so that it can maybe be found? Salut! Merci for all of this wonderful information! My students are loving this unit!! Would you be willing to share the comprehension activity that you give them for the Paris Children’s book? Is the book that you use the Paris Mes Années Pourquoi or is this only for their IPA. I bought the book as well as the fan 🙂 Merci mille fois!! Bonjour! I don’t have the titles of the Paris books here at home, but they are different than the one that I used on the IPA. I’ve just cleaned out my classroom and all of my books are packed away, so I’m afraid that I can’t be of much help. I’m so sorry!